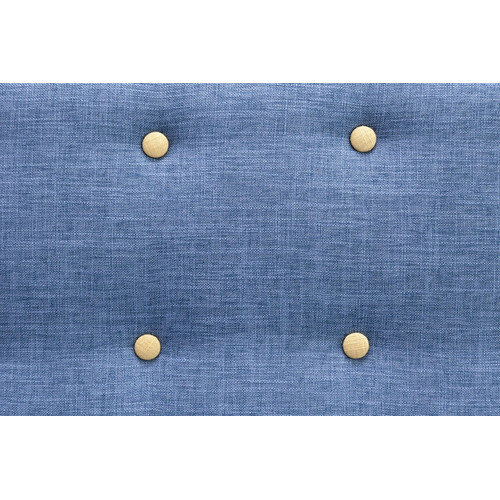 The 6ixty sofa comes in blue with yellow contrast buttons. The base is solid Ash and the frame hardwood with a durable synthetic mix cover over comfortable foam inserts. 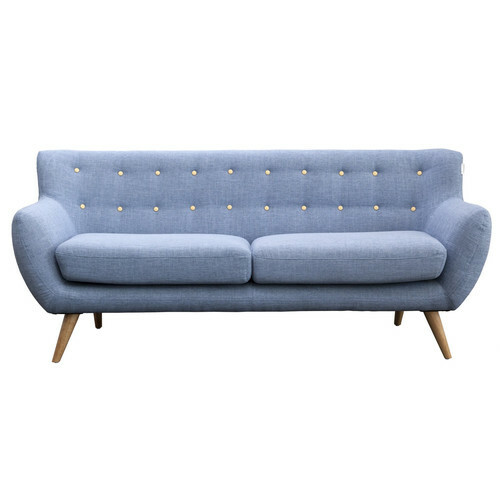 The 6ixty sofa is a mid-century, Scandinavian inspired design to enhance home and office. Our first in house designs, the 6ixty range of solid American oak furniture has become a design classic both within Australia and overseas. This range develops on the mid-century design ethic but adds a unique new twist. Strong colour has been added. Uniquely they are the first designers to introduce the flexibility of being able to reverse the colour to an oak finish if the customer wishes, giving 4 distinct looks to the one item. The 6ixty line is manufactured from solid ‘A’ grade American oak in Northern China. The 6Ixty 3 Blue Seater Sofa is a Contemporary or Mid Century style product. Contemporary style bridges the gap between traditional and modern. Pieces feature simple and clean lines with smooth surfaces without any carving or adornment. You can shop for more Contemporary or Mid Century Sofas & Lounge Sets in the Furniture section of our site. When you buy a 6Ixty 3 Blue Seater Sofa online from Temple & Webster in Australia, we make it as easy as possible for you to find out when your product will be delivered to your home in Melbourne, Sydney or any major city. You can check on a delivery estimate for the 6ixty Part #: 63BL here. If you have any questions about your purchase or any other Sofas & Lounge Sets product for sale our customer service representatives are available to help.Whether you just want to buy a 6Ixty 3 Blue Seater Sofa or shop for your entire home, Temple & Webster has a zillion things home.